ARCATA – Cypress Grove Chevre has abandoned plans to install a 1,200-goat dairy on the Arcata Bottom and will look for an alternate site. The decision follows a meeting last night in which neighbors voiced multiple objections. 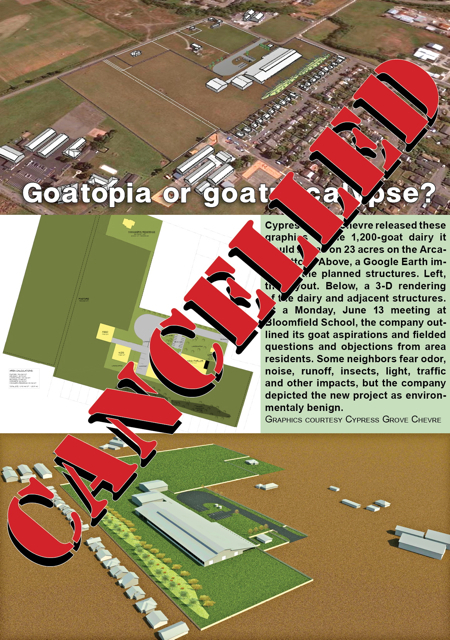 Arcata, CA – (June 15, 2011) – Humboldt County-based Cypress Grove Chevre announced today that it will no longer pursue the purchase of the 23-acre pasture west of Q Street in the Arcata Bottom to develop a new goat dairy adjacent to its existing creamery. Cypress Grove still plans to build a modern, humane certified, 1,200 to 1,400 goat dairy using a proven western-European model of maintaining herds within well-ventilated and naturally lit indoor spaces while providing outdoor access for all animals. The vast majority of animal waste will be closely monitored, collected and composted with straw. This mixture will be stored in large, covered concrete bins, resulting in a final product of excellent fertilizer. The dairy will create 12 living-wage, fully-benefited jobs between the two facilities. Cypress Grove will continue searching the area from McKinleyville to Ferndale for suitable property. About Cypress Grove Chevre (www.cypressgrovechevre.com) Cypress Grove Chevre is the leading producer of fine American goat cheese, including the top- selling American artisanal classic, Humboldt Fog. Founded in 1983 by Mary Keehn, Cypress Grove continues a tradition of innovation by introducing original American cheeses to the marketplace, such as Truffle Tremor and new Herbs de Humboldt. Based in Humboldt County, CA, where the Redwoods meet the Pacific, Cypress Grove‟s award-winning family of products can be found at fine retail outlets and restaurants across the country. Cypress Grove‟s mission is to provide its customers with an innovative and unique selection of cheeses while taking care of its employees, community, dairies and the environment. This entry was posted on Tuesday, June 14th, 2011 at 4:01 pm	and is filed under News, Community. You can follow any responses to this entry through the RSS 2.0 feed.